Hi guys! 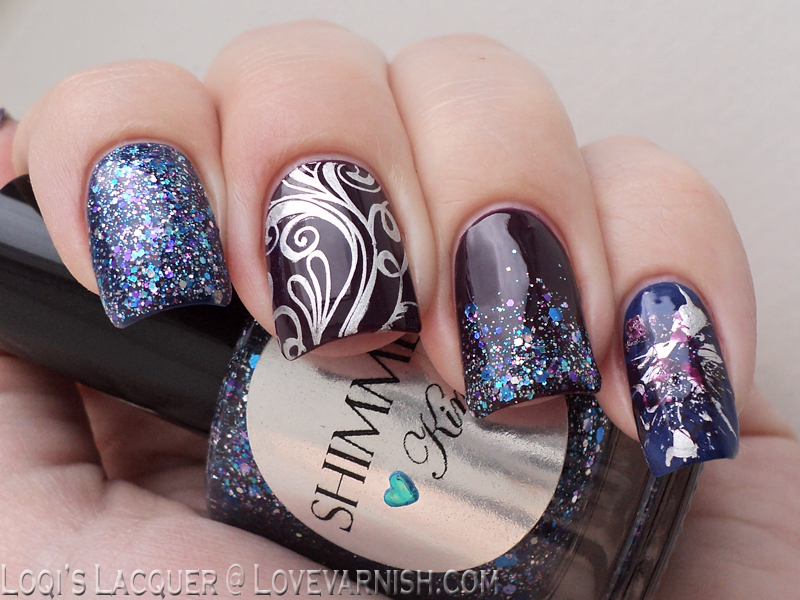 Today I've got some more nail art for you with my new Shimmer polishes! I made another skittlette with Shimmer Kim, a lovely blue, silver and purple mix. And I did a matte layered manicure for you with Shimmer Tiffany, a very soft pink and blue polish. Both of these polishes have a clear base, and this week I picked colours that aren't part of the glitter mix to layer them over. Do you want to know which base colours I used for these polishes? 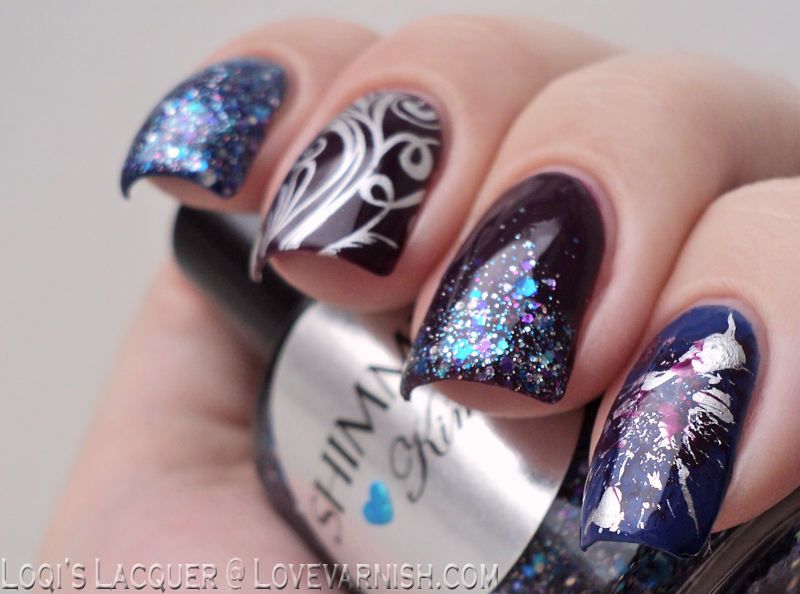 When I picked Kim to do a manicure I wanted to use a purple creme in the same colour as the purple glitter in the mix. 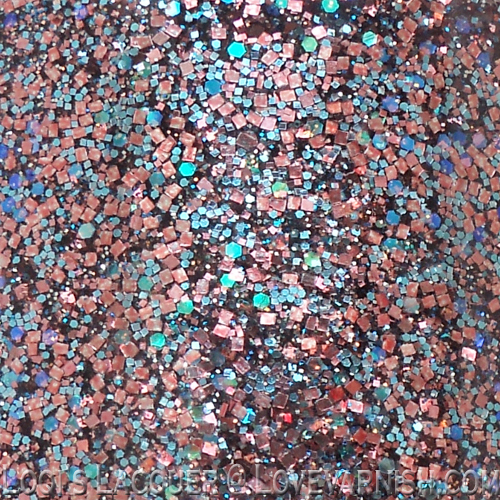 I thought I had found a perfect match with P2 Call me, but it turnes out it's quite a bit darker than the glitter in Kim. It was a happy little accident though, because I love the combination of the glitter over this darker purple! 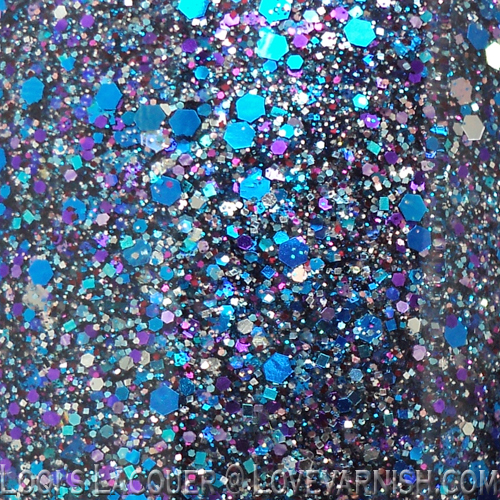 As I mentioned above, Kim is a mix of blue, purple and silver glitter in different sizes in a clear base. To represent the blue and silver on my other nails I used China glaze Manhunt and Millennium to do a splatter nail in my pinky and some stamping in my middle finger (the pattern is from MoYou plate Princess 13 XL). For my index and thumbs I used to 2 coats Kim over a base of Manhunt and for my ring finger I used the mostly wiped off brush from Kim to do a gradient over Call me. I am really happy with how this manicure turned out! Kim is a beautiful polish and he great thing about these skittlette manicures is, that if they look nice, they will give you a couple of ideas for a full manicure. I will definitely do the gradient and the splatter again! I must admit that Tiffany did not appeal to me at all in the bottle. The combination of the pink and blue gives this polish more of a copper-ish look and I thought it looked a bit dull and flat. I decided I would try it matte to see if it appealed to me a bit more if it was completely muted, and now I love it! 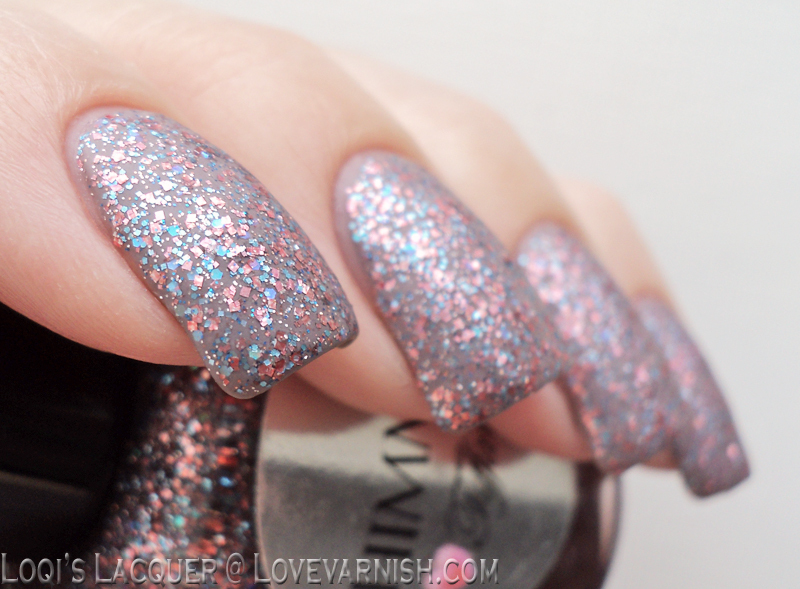 Even though it's a glitter polish, matte it looks so sophisticated! Since Tiffany has a clear base it needs to be layered to be opaque. I decided I would pair it with Essie Chinchilly, because I thought it would compliment the muted colours nicely. Shown here is 2 coats of Tiffany over Chinchilly with one coat of matte topcoat. Even without a real topcoat the result is quite smooth because Tiffany only has really small, mostly square glitter, which settles nicely. Shimmer polishes are available at their website or Etsy for 12$. I hope you guys like this post and see you next week! yep, in Russia you can buy Dance Legend in various drugstores (though their official store still has the widest product range). 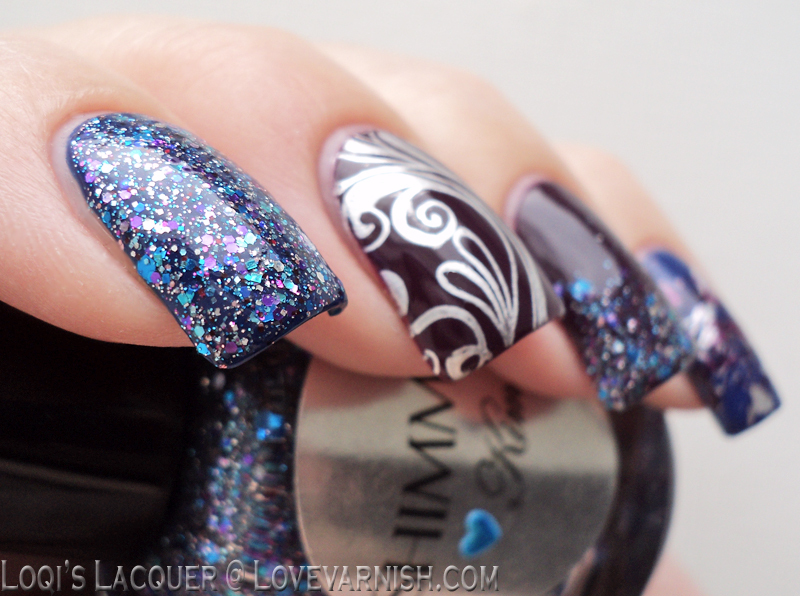 Both of these polishes are GORGEOUS but I ADORE your Kim mani... get on my fingers now! I absolutely love your skittles with Kim, so so beautiful! How awesome must that be :D oh well, everyone has brands they wish to buy in store that others have and vice versa. I love LOVE this first mani!!!! Gorgeous!!!! Oooh don't feel sorry, I love chatting with you :-). And if you ever want some Catrice, Essence or H&M polishes just let me know, we might be able to work something out. Thank you, that is so sweet of you! Essence and Catrice bring most of their core polishes to us and some LE collections (not all, though), but no H&M so far - though we have H&M clothes stores. Other than that we don't really have any spectacular offerings, lol. Unless I hop over to Germany but that's about an hour away. Thanks! I love doing skittlelettes with these polishes, they are perfect for it.